Angkor is the greatest architectural site in Asia, made famous in recent times as the location for Tomb Raider. It is a city of legend only recently (1860) rediscovered. Today, international missions from Europe, China and Japan are working at restoring some of the main temple structures. While some remain off-limits to the public, the major temples are usually open to tourists. 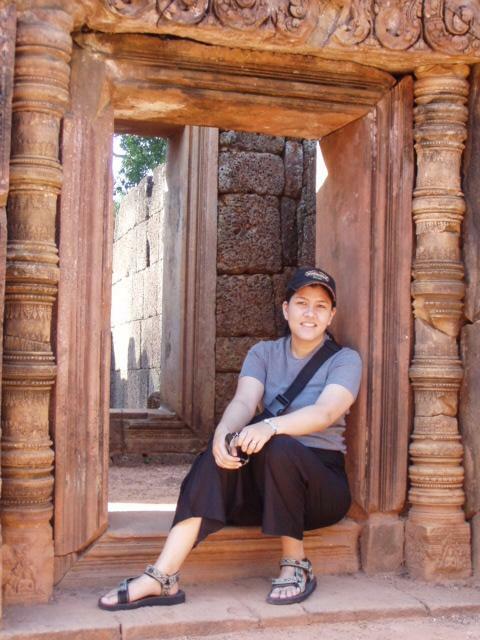 Do come to Cambodia and be inspired by the grandeur of an ancient civilization. When to Go: Any time, even the wet season. March and April are the hottest months. Best time to travel would be November-March. 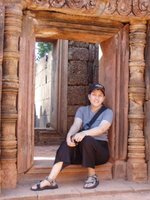 Lodging: There are many hostels and hotels mushrooming left and right in Siem Reap which cater to the budget (<$10 to >$200) and taste of all tourists. You may get a listing at www.asiahotels.com. There are no direct flights to Siem Reap from the Philippines. Most travelers use Bangkok, Singapore or KL as their jumping point. For budget travelers, there is Air Asia (www.airasia.com) or Bangkok Air. Since we had enough mileage for a return trip to Bangkok, we took advantage of Bangkok Air’s Discovery Airpass which enabled us to go Bangkok-Siem Reap-Phnom Penh-Bangkok for only $210. We bought our Airpass (http://www.bangkokair.com/discoveryairpass/) ticket through Cherry (sanyawadee@traveller2000.com). We paid via credit card and asked that the tickets be sent to the Philippines via courier. Make sure to book ahead as there are a limited number of Discovery Airpass slots per flight. The Site: Angkor passes are available for a day, three days, or a week. Rather than be captive to backbreaking dawn to dusk schedules, I suggest that you a hire a car and guide (can be arranged by the consierge at the hotel you are staying) and go at your own pace. 3-4 days will be enough to scratch the surface of Angkor and Siem Reap. You can purchase books about Angkor at Siem Reap for less than $5. Available at the local talipapa along with silk shawls, wood and stone carvings and various artifacts. Another invaluable resource for us was the "Tour of Angkor" article by Nick Ray, author of the Lonely Planet Cambodia guidebook and location manager for Tomb Raider. Currency: Cambodia’s currency is the riel but you may use the USD in day-to-day transactions in Cambodia. Visas: Southeast Asian nationals belonging to the ASEAN enjoy visa-free intra-regional travel. Yehey! This is subject to tenor restrictions so be sure to check with the nearest Cambodian embassy first.